The charging and rotation gimmick requires a special case that is available for a wide variety of smartphones, including the iPhone 5s and newer. The case does have a protrusion on the back, that measures 4 centimeters wide by 0.7 centimeters deep, adding a depth similar to that of the iPhone itself to the back of the device. It is not clear from the details provided in the campaign if this protrusion is removable from the case. A pair of different sizes for the OvRcharge wood base will be available if the project is successfully funded. The standard base is 140mm square, with a depth of 33 millimeters, and provides about 500mAh for charging. The larger OvRcharge Ultra is 170mm square, with a depth of 35 millimeters, and supplies around 700mAh. In the case of a power outage, the phone will not immediately plummet to the base. The company claims that phones charging will continue to remain in the air for up to four to five hours, depending on base model as "there is a built in battery in the unit." 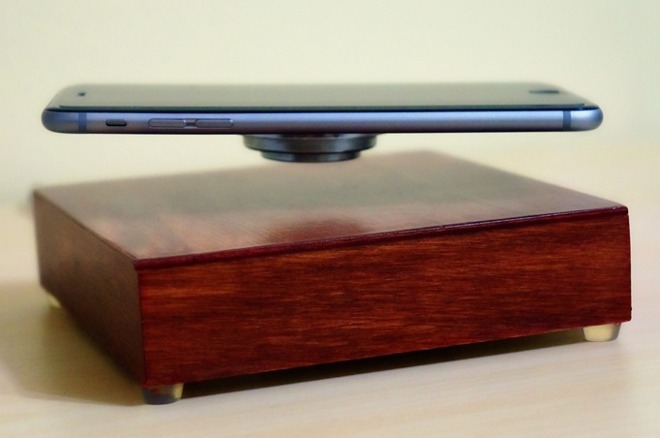 Extra magnets to "levitate" other objects are available. Additionally, for phones not supported, the company notes that a third party attachment containing a coil and magnet is also for sale, suitable for connection to any device's existing case. The company does not claim that the OvRcharge adheres to any existing wireless charging standard. Apple is said to be working on its own wireless charging protocol for inclusion in a 2017 iPhone, which might pose compatibility problems with the OvRcharge. The company is seeking $239 CAD ($185 U.S.) on Kickstarter for a complete kit with the standard OvRcharge base and one phone case of the pledger's choice. Extra smartphone cases are available for $29. As with any crowdfunded project, the product is not guaranteed to come to market, even if successfully funded.